The outside has the main print on the inside repeated, and a second masonic print, probably from an engraved plate by Evans. The other two prints on the outside are groups of figures in landscape without Masonic reference. One may be derived from "Miss Nancy Dawson dancing the Hornpipe" which was used on tiles in the early 1760s (Anthony Ray, Liverpool Printed Tiles, 1994, no. B4-3). 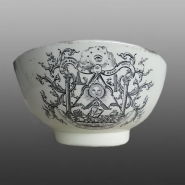 Wedgwood creamware bowl printed in black in Liverpool by Sadler and Green with Masonic and other prints, together with the inscription A HEART THAT CONCEALS/AND A TONGUE THAT NEVER REVEALS. The Masonic prints are in the style of the engraver Jeremiah Evans. Evans was himself a Mason, and the engraving for a certificate issued by the Sea Captains' Lodge in Liverpool is signed "Bro. Evans fecit" meaning that he engraved it. Evans probably remained in Liverpool until at least 1785 when he revised the copper plates used for printing the chart of the River Mersey.